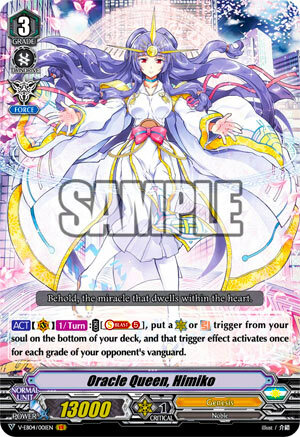 [ACT](VC)1/Turn:COST [Soul Blast (5)], put a [Critical] or [Draw] trigger from your soul on the bottom of your deck, and that trigger effect activates once for each grade of your opponent’s vanguard. That’s a pretty dank Grade 3 we got here. Soulblast 5 is less of an issue given we have Soulblast reducers in the deck and Genesis does have enough cards to load soul that aren’t straight -1s (although some are…). Being able to load up a unit with three extra Criticals with power, or just spread it all out is good to shave down hand. The big letdown is that soucharging a Draw or Critical is random, and only Cumin actually allows you to CHOOSE a Draw or Critical to load for Himiko, which kills her viability somewhat. Still, Himiko is obviously not the main attraction – that honor goes to G3 Artemis, so try to hang on to her until Cumin’s time is right. She’s no Waterfall level finisher in terms of bullshittery but once she goes she goes.